Sars is a serious respiratory virus, which killed nearly 800 people worldwide in the months following its emergence in November 2002. The World Health Organization announced that the outbreak had been contained in the following July. However, experts predict the virus will continue to pose a threat - and warn that health authorities need to be ever vigilant for its return. When is Sars likely to pose the biggest threat? Scientists predict that the virus which causes Sars is likely to re-emerge in cold weather, in a similar fashion to the viruses which cause flu. However, they have stressed that the number of cases is unlikely to be on the scale of the 2002/03 outbreak. What are the dangers of Sars spreading? The best way to stop the spread of Sars is to isolate people with the virus and those thought to have been in contact with them. In this case, officials have quarantined 25 people who have been in contact with the patient. They have been ordered to stay at home to minimise any risk of the virus spreading. However, officials have stressed they believe this is an isolated case. 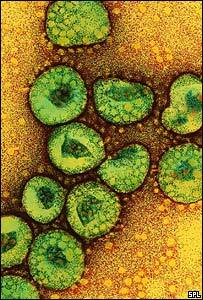 How did Sars virus first come to the world's attention? The first reports of an infection followed the death of a US businessman in a Hong Kong hospital in mid-March. The man had visited China and Vietnam - hospital staff there and in Hong Kong subsequently fell ill. However, the virus is believed to have originated in China's southern Guangdong province in November, and was spread around the world by air travellers in February. Experts believe that after infection with Sars, the incubation period can be up to 10 days. Known symptoms are similar to those of flu, including high fever, headache, sore throat, and cough. Patients who have recently returned from a country where Sars is prevalent - or who believe they have been exposed to an infected person - should consult a doctor if they develop these symptoms. At present, the mortality rate is approximately 4% - four cases in 100 are fatal. However, this may vary depending on the quality of medical care available. Is there a treatment or vaccine? There is no vaccine. There is also no specific antiviral treatment designed to treat Sars. However, a cocktail of antivirals and antibiotics appears to be beneficial if treatment is started early. In some cases of Sars pneumonia has developed, with patients finding it very hard to breathe - some have required artificial ventilation in hospital. Scientists now believe they have confirmed the culprit. The scientists, from the US Centers for Disease Control, believe it is Corona virus - a family of viruses well known as a cause of the common cold. The WHO believes this is a new strain which has mutated to become more dangerous to humans. Health officials have become particularly concerned about a jump in the number of young people infected. Many of the deaths have been among the elderly, but fatalities have also included an otherwise healthy 37-year-old man in Hong Kong and two people in their mid-50s. It is likely that infection takes place through droplets of body fluids - produced by sneezing or coughing. An official report into a mass outbreak in a Hong Kong apartment block concluded that the virus had spread through a sewage pipe. The WHO did not rule out the possibility that it may also be transmitted when people touch objects such as lift buttons. Last year, Hong Kong has advised people to avoid crowded places and confined spaces. Airlines insist that an infected person cannot spread the virus throughout an aircraft. However, the WHO says that people sitting within two rows may be at risk. Some people in east Asia have taken to wearing face masks, but it is unclear exactly how much protection they offer against viral particles. Professor John Oxford, a virology expert from Queen Mary's College in London, told BBC News Online: "There's not much you can do to avoid this, unless you go and live as a hermit. What did governments and experts - and airlines - do to stop it? The WHO global alert triggered responses from health experts in dozens of countries. Doctors were asked to look out for cases, particularly arising in patients who have recently returned from abroad, and notify public health services so that the spread of the illness could be monitored. Airlines were asked to look out for passengers who appeared unwell while checking in. They were also been advised to disinfect aircraft in an attempt to stop its spread. What advice does the UK government have for travellers? The Department of Health says there are no current Sars-related travel restrictions . But it says travellers should be aware of Sars symptoms and seek medical advice if the develop them within 10 days of returning from an affected area. The latest advice is published on the Department of Health website.